Maharashtra State Road Transport Corporation (MSRTC), also referred as ST, had established online service for booking bus tickets. One can either book or cancel their bus tickets online between 00.30 am and 23.30 pm. The tickets can be booked prior to one month and even four hours before the commencement of journey. The web link to book MSRTC online service to book bus tickets is:: MSRTC :: Online Reservation System. The web link to visit the official MSRTC website is Welcome to the official website of MSRTC. 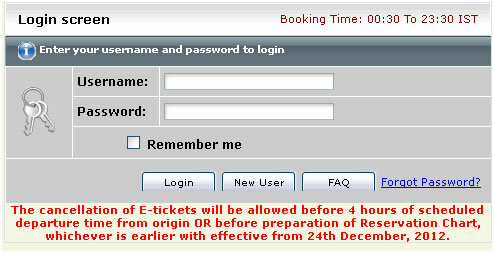 To book tickets online one should visit www.msrtc.gov.in and click on the title ‘E-TICKET RESERVATION’. Next step is to type their User name and password and the click on ‘login’. In case, if it is new booking, then one should click ‘New User’ and register their personal details. After this, type the details of the bus and click ‘Search’. Following this, one can select their specific Route and Preferred Bus from the displayed list according to their own convenience and click ‘Get fare’. Enter the details of Boarding, Alighting and also Passenger information and click ‘Go’. One can view the details of ticket booking followed by the acceptance of their terms and conditions and later click ‘Make Payment’. Here one should select ‘Itz Cash’ as their preferred payment option and click ‘Submit’. Next, enter the ICW Master Account no. of 12 digits and its password of 4 digits and the click ‘Continue’. This E-Ticket gets generated and one should take a print out of this for future reference. There are numerous components that form a part of our social constitution like the social corporation ST discount travel and air fare from the very start is offered. Public service, tribal workers, Dalitamitra puraskarthi and freedom fighters continue working for the society and Shaheer annabhau Sathe puraskarthi people are allowed by the discount travel free corporations ST sevakanca division are precise. The total capacity of this social constitution offered the ensuing table Savalatinca Rental Travel ST SRTC or buses of State Road Transport Corporation that comes to capacity of our social constitution or stays on this table fare concession.